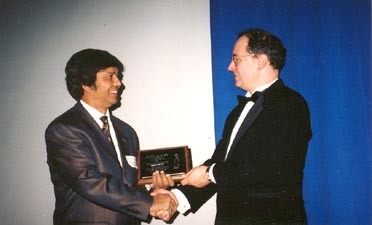 Manick Sorcar receives The Bronze Plaque for his animation "Rule of Twenty-One" from Lance Carwile, Chair of Entertainment Division, 51st Columbus International Film Festival. 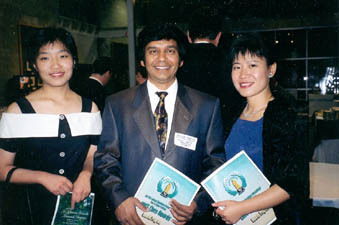 November 8, 2003: The Film Council of Greater Columbus formally awarded The Bronze Plaque to Manick Sorcar for his latest animation "Rule of Twenty-One", at the 51st Annual Columbus International Film Festival. The animation was produced, directed, animated, and musically scored by Manick. The festival attracted over 600 entries from throughout the world. 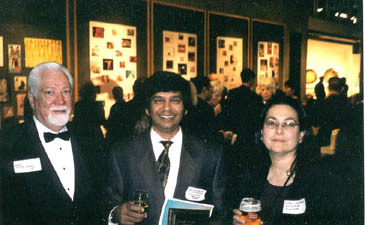 It was held at the Columbus College of Art and Design in Columbus, Ohio, USA. "Rule of twenty-One" was premiered a year earlier at Uttam Mancha theater, Kolkata, India, on December 21, 2002. 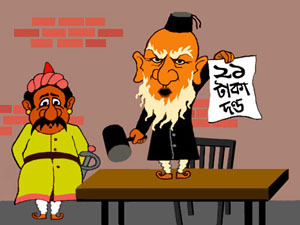 "Rule of Twenty-One" is based on Sukumar Ray's famous nonsense verse "Ekushe-Aine" from Aabol Taabol, which is Manick's second animation from that book. 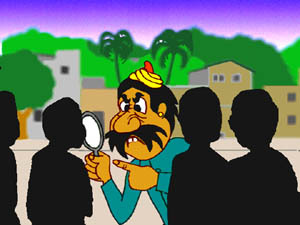 The first was "Sniff", based on "Gandhabichar", which won The Golden Eagle from C.I.N.E., Washington D.C., and was a Finalist in the Children's Program category at the 36th International Film and TV Festival of New York. In his award-acceptance speech, Manick thanked the jurors for the prestigious award. He said he grew up in Kolkata, India, reading nonsense poems of Sukumar Ray and fell in love with them. "I'm happy that my animation has contributed to bring this priceless treasure of Bengal to an international attention and appreciation". 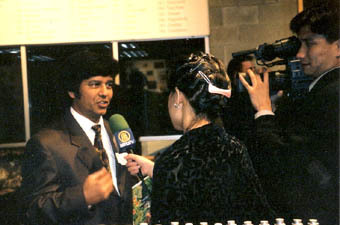 The festival was attended by movie buffs from many countries including NTDTV of Taiwan who interviewed Manick for his award-winning animation.